The watchwords with Hunters are “long and low.” They should have a long sweeping stride; 12′ is expected at the canter. The horse’s movement should be efficient, covering the most ground with the minimum expenditure of energy. Over fences, judges look for precise movement of the limbs and roundness over the jump. The course usually consists of 8-12 elements, with a set number of 12′ strides between them. The horse is judged by its smooth pace through the course, jumping ability and movement. A Hunter’s conformation should be balanced. Movement and conformation relate back to the hunting field where endurance and agility were a requirement. Working hunters are judged solely on performance; movement and jumping form. Conformation hunters are judged 70% on performance, 30% on conformation. Green hunters are typically younger horses with less than two years of show experience. Pony hunters are judged on the same basis as junior hunters. There are three sections: one for small ponies, one for medium, and one for large. Amateur Owner hunters are horses under regular hunter conditions, ridden and owned by an amateur no longer eligible to ride in junior classes. Classes are divided by age 18 to 35, and second age group is 36 & over. Ladies Side Saddle was considered for centuries the only way for a lady to proceed “properly” on horseback. The under saddle class is scored 75% on performance and 25% on formal hunt appointments (accessories considered necessary in the hunt field.) The over fences and hunter hack classes are judged upon the horse’s performance, suitability, manners, jumping form, and consistency. Hunter Breeding is judged on conformation, quality, substance and suitability to become or, in the case of sires and dams, apparent ability to produce or beget hunters. Equitation classes are judged on the rider rather than the horse. Judges are looking for style of riding, skill and accuracy, judgment in the use of the aids (hands, seat, and legs) – a general impression of complete, quiet control. The Jumper is the “athlete” of the show. His task is solely to jump, regardless of style or manner. While Hunters are scored subjectively, Jumpers are scored objectively. Scoring is based on a point system for faults in jumping (knocking a rail down or a refusal) or exceeding the specified time limit. Jumper courses tend to be much more complex and technical than hunter courses, because riders and horses are not being judged on style. The winner is the horse with the lowest number of faults. Time is also a factor in deciding the outcome of an event. In the case of a tie after the first round, jump-offs are sometimes held over a shortened course, and the competitors must compete against the clock. 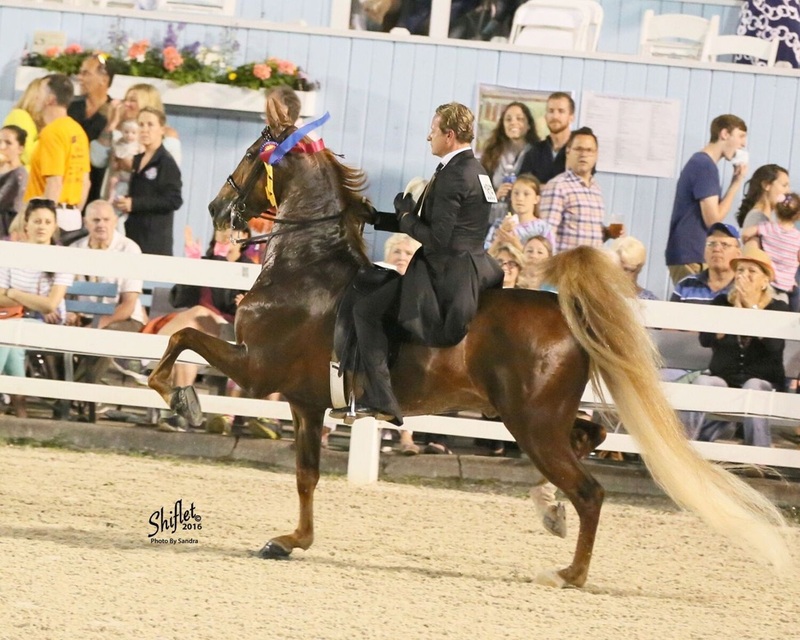 The Saddlebred is exhibited in several different divisions including five-gaited, three-gaited, fine harness, pleasure, park, and western. Three-gaited Saddlebreds perform the walk, trot, and canter. Five-gaited Saddlebreds also perform two gaits unique to the breed: the slow gait and rack. The slow gait is a smooth and controlled gait with the horse’s power directed to its hindquarters. The rack is a high-speed gait and is sometimes nicknamed “the single foot” as there is only one hoof on the ground at a time. 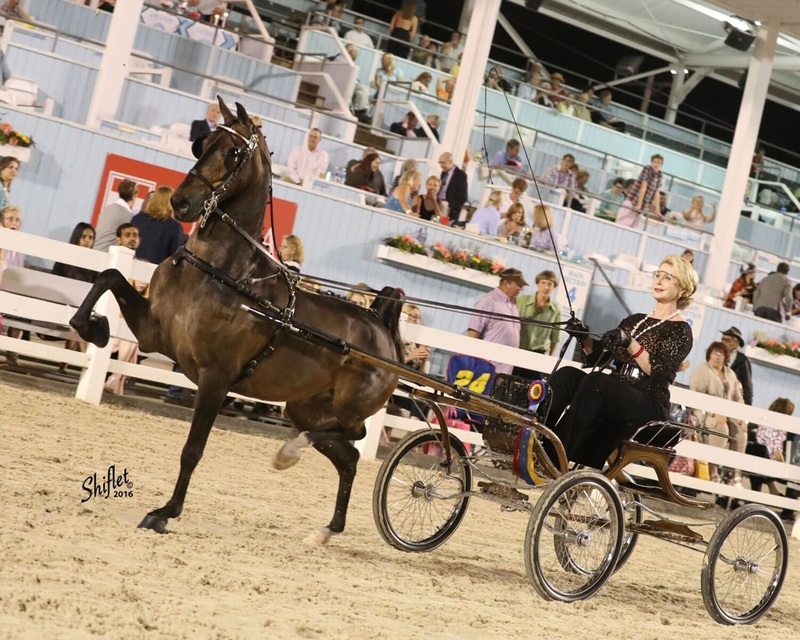 Another major division for Saddlebreds is fine harness. 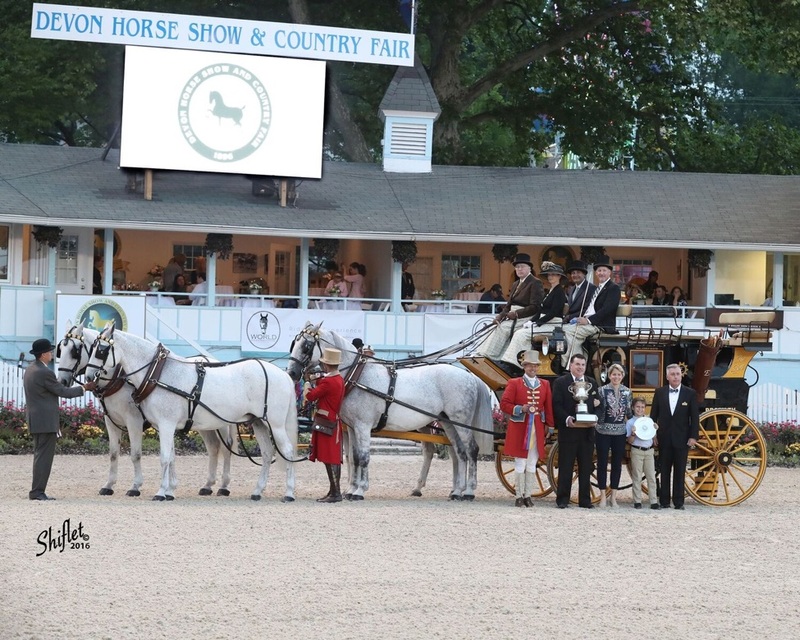 In this division, Saddlebreds perform the animated walk, trot, and “show your horse” gaits while pulling a four-wheeled buggy. When the “show your horse” gait is called for, the driver may alter the speed to best showcase the horse’s ability and talent. The Roadster must be a standardbred or standardbred-type horse, attractive in appearance, balanced in conformation, and have manners that make a safe performance in the ring. The principal gait for Roadsters is the trot. They are asked to trot at three different speeds; the slow jog trot, the fast road gait and then at full speeds. Judges may ask a Roadster to walk. When originally used on the roads, they were walked occasionally for a chance to rest. The Hackney was originally imported in the 1800s from England. They became known as the elite carriage horses of the day. There are Hackney ponies and horses. The breed is a known as the “Aristocrat of the show ring” due to their amazing athletic ability and presence. The four Hackney pony divisions at Devon are the Hackney pony or cobtail, the harness pony, pleasure driving pony and roadster pony. The harness pony has a long mane and tail is smaller than the cobtail. The cobtail pony is shown with the appearance of a braided mane and short tail. Both are shown to a beautiful four wheeled buggy called a viceroy. The pleasure pony must have quiet manners and be shown by an amateur. Their vehicles have two wheels, and they make a handsome picture. Roadster ponies are the speedsters of the pony world. They are shown to a two-wheel road bike by a driver wearing racing silks. It is always a crowd pleaser! Friesians are a breed of horse originating in northern Netherlands and dating from the Middle Ages. Abundant long leg hair and a very long mane and tail are characteristics of the Friesian. The color is always black, and only a white star in the forehead is permissible. 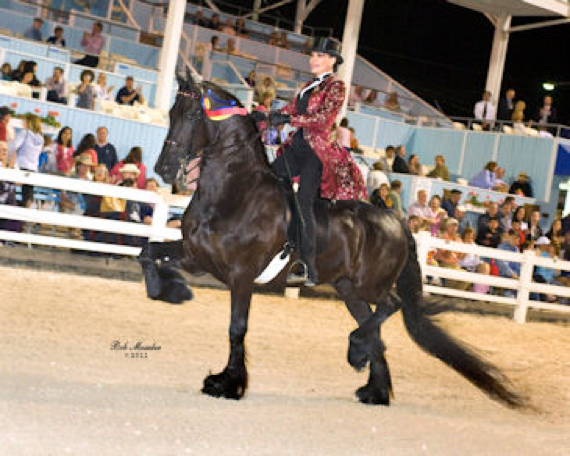 Friesians are shown at a flat walk, animated trot, strong trot and canter. A road coach is a twelve-seat closed vehicle for public transport on a scheduled route. Generally, they were heavier than private coaches and would be drawn with horses chosen for their suitability for the work rather than for color or style. The park drag carriage was a lighter, more elegant version of the road coach. A park drag has seats on its top. Some coaching classes are judged on performance, manners, presentation, and appointments. The whip and passengers are attired in a manner appropriate to the season and type of show. Devon is considered a “country” show, so lighter colors and clothing are worn. Others are judged on time and faults over a course in the ring. The horses are required to work as one unit to keep a clean line through the course. Devon also features a coach horn competition. 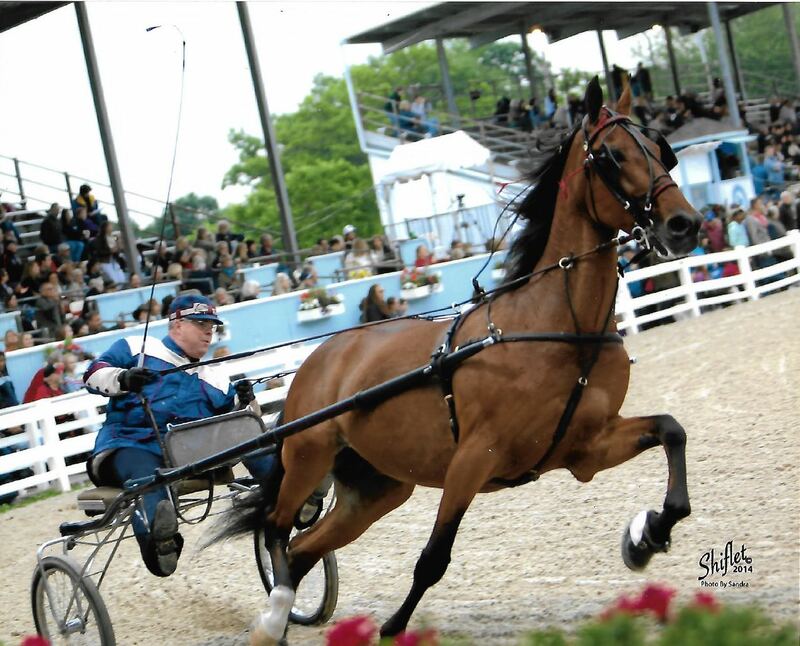 The Carriage Pleasure Drive is one of the high points of Memorial Day weekend at Devon. A multitude of carriages, in nine different classes, from single harness to four-in-hand, gather in the fields at St. Davids Church. The “unofficial” judging begins with the elegant and elaborate tailgates that many of the carriage owners and their guests stage prior to departing for the Devon show grounds beginning at noon. The official judging begins as each section is judged for turnout. The carriages proceed along a roughly 4.5 mile route through residential neighborhoods of the community. Many homeowners along the route stage elaborate festivities of their own with friends and family gathering to cheer the carriages as they pass by. The carriages are judged along the route and then again when they arrive at the Dixon Oval. They are judged for condition of the horses and ponies, soundness of wind and limb and complete turnout. The maximum time allowed for completion of the route is 40 minutes. Awards are given for best turnout in each class. Several other driving classes may be seen at Devon. Open Tandem and Unicorns classes are judged on the performance, quality, uniformity and manners of the animals. Scurry classes are a timed event with either a single horse or a pair driven to a four wheeled antique carriage through a course of obstacles (cones with balls set on top.) Ten seconds is added to the time for each ball that is knocked off, with the fastest time winning. Single and Pair Pleasure Turnout are judged 40% on performance, manners, way of going; 30% on the condition, fit and appropriateness of the harness and vehicle; 15% on overall impression; 15% on neatness of attire. Amateur – A competitor who receives no prize money or compensation whatsoever for any equestrian related services. Champion – The winner of a collection of related classes. Clean Round – In Jumper classes, when a horse completes the prescribed course within the time allowed, without incurring jumping faults. When more than one horse has a “clean round” a jump-off occurs. Competitor – The horse, rider (or handler, driver) or the horse/rider combination that is being judged in a class. Conformation – The correctness of a horse’s bone structure, musculature, and its body proportions in relation to each other. Dixon Oval – The main ring at Devon, named after F. Eugene “Fitz” Dixon. Gambler’s Choice – A jumping event in which exhibitors choose their own course, with each fence cleared worth a given amount of points based on difficulty. The entry who accumulates the most points within a set time limit on course is the winner. 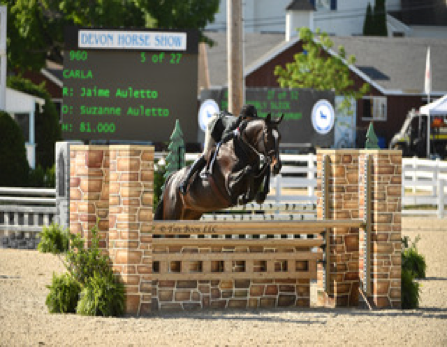 Grand Prix – The highest level of show jumping, the horse jumps a course of 10 to 16 obstacles, with heights up to 5 feet 3 inches and spreads of up to 6.5 feet. Eventing – One of the three Olympic equestrian disciplines, is a formidable combination of Dressage, cross country and jumping done over a 3 day period with the same horse for each phase of competition. It is a true test of both horse and rider in all aspects of horsemanship and athleticism. Devon hosts a hybrid of the 3 day format, all in one night. Exhibition – A recognized but unrated class or a demonstration. Exhibitor – The owner or lessee of a horse entered in a class. In equitation classes, the exhibitor is the rider. Knockdown: An obstacle is considered knocked down when a horse or rider, by contact, lowers any element that establishes the height of an obstacle. Each knockdown results in four faults. Refusal: When a horse stops before the fence or runs out to the side of the fence to avoid negotiating the obstacle it is called a refusal. The first refusal results in four faults, the second in elimination. Time Fault: Each second, or fraction thereof, over the time allowed results in one fault. Combination: Two or three jumps in a row, with no more than two strides between each. Oxer: Also known as a spread fence, consists of more than one vertical element taken as one jump. Vertical: A fence consisting of a single vertical element with no spread. Groom – In coaching, a liveried attendant to assist with the horses. Variant: one responsible for the everyday care of a horse or responsible for the animal’s preparation for showing. Hand – A hand is the unit used to measure horses. One hand is 4″. Horses are measured from the ground to the top of the withers. Jump-Off – Generally horses that are tied for other than first place will remain tied and the prize money divided equally. Horses tied for first place after the first round must jump-off in a timed jump-off round. The winner of the class is the horse with the fewest faults and the fastest time. Junior – A rider who has not reached his or her 18th birthday by December 1 of the competition year. Local Classes – Classes with entry restricted to a territory local to the event as described in the prize list. 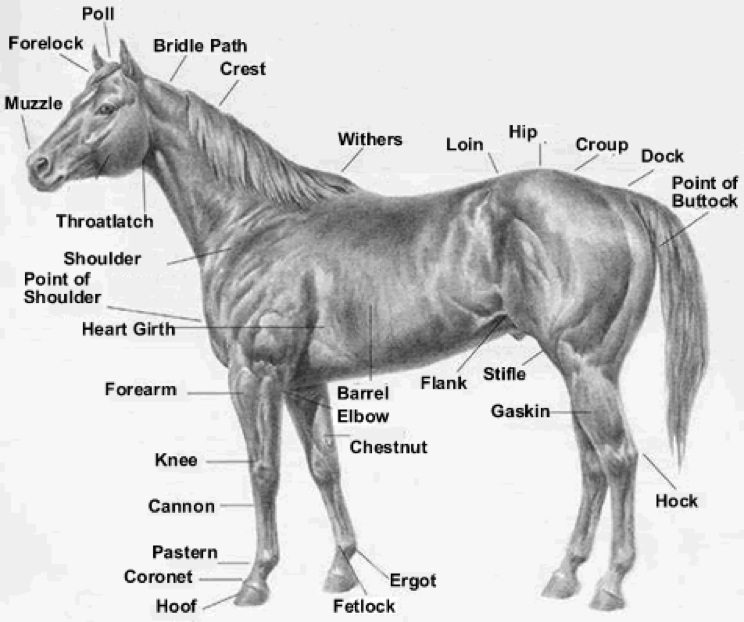 Off Course – A horse is considered off course if it deviates from the course as outlined on the posted diagram. Open Classes – Are open to all competitors regardless of previous awards or points received in accordance with division rules. Pair – Two horses or ponies driven side by side. Pony – A pony is a horse that measures less than 14.2 hands. Show ponies fall into one of three size categories for competition: small – less than 12.2 hands, medium – over 12.2 but less than 13.2 hands, large -over 13.3 but less than 14.2 hands. 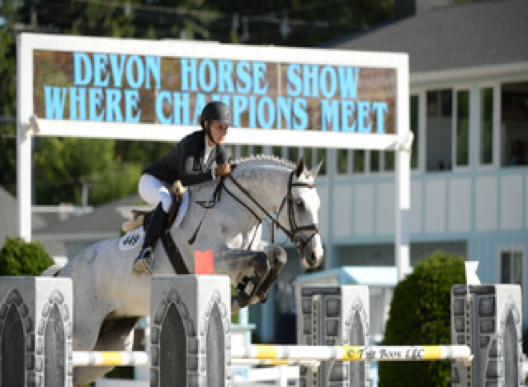 Qualifying – Devon is one of four “qualifying” shows in the United States, meaning that for most Hunter and Jumper classes a competitor must have accumulated enough points at recognized competitions, as determined by the USEF, to enter. The other three shows are the Pennsylvania National Horse Show, the Washington International Horse Show and the Alltech National Horse Show. Reserve Champion – The first runner up in a collection of related classes. Schooling – Practicing or training before the competition. Stride – The amount of ground the horse covers in one “step” is called the horse’s stride. At the canter, the average single stride of a horse is 12 feet. The distances of the Grand Prix courses are set accordingly. Tandem – Two horses or ponies, driven one in front of the other. Time Allowed – A specified period of time to complete the course. If the time allowed is exceeded, time faults will be added to the horse’s score. Tootler – The horn blower in a coaching competition, the tradition dates back to English mail coaches signaling their arrival. Trainer – An adult who has responsibility for the care, training, custody or performance of a horse or horse/rider combination. Turnout – A coach or carriage together with the horses, harness and attendants. Variable: to put a horse to pasture. Unicorn – Three horses or ponies, driven one in front of two side by side. USEF – The United States Equestrian Federation is the governing body for licensed horse shows. Voluntary Withdrawal – A rider makes the decision not to continue on the course and leaves the ring, usually with a nod of the head or tip of the hat to the judge. A rider may decide to withdraw because of a problem with the horse or trouble negotiating the course, or because the rider knows he or she has too many faults to place in the ribbons. Walking the Course – Because riders and horses may not practice on a jumper course before the competition, riders are permitted to walk the course and check the fences and distances by pacing off the strides. Walking the course allows the rider to decide the proper number of strides between fences to assure a smooth ride with the fewest faults. Wheeler Ring – The smaller of the two competition rings at Devon. Whip – The driver of a coach or carriage.